We all know those readers: the ones who voraciously devour every book, who love finding new details about the topics that they love, who read and read and read. As a classroom teacher, it's easy for me to identify these students and build a classroom to support them. I love to use flexible assignments so students don't have to waste their time with busywork; I build a wide classroom library with texts on many topics; I make time in the classroom for students to share their lives beyond school. But I don't want to stop there! I want to turn every reader into a motivated reader. This is more easily said than done, however. How do we create engaged readers? 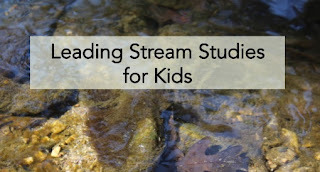 This fall I took students on a field trip that included a stream study. In previous years, I had made sure that students were well prepared for the stream study ahead of time. We read texts about the biotic index, we practiced identifying stream creatures, and even did practice inventories. What made this year different? I focused a bit more on watersheds at the outset, which meant that the stream study readings would have to take place after the field trip. I was even a little annoyed at myself at my poor timing when I realized this! When students jumped into the text after the field trip, however, I realized that something amazing had happened. I used a text from my Problem and Solution Text Structure packet called "The Biotic Index." 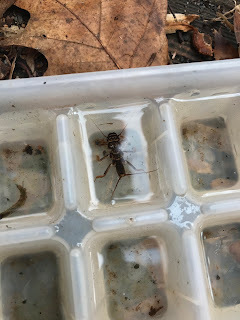 In past years, students have had trouble moving beyond the topic of the text (macroinvertebrates) to be able to think about the structure of the text. This time, though, they showed far deeper comprehension. As I walked around the room to listen in on their partner discussions and see their graphic organizers I could see evidence of stronger connections and more effective analysis. What was happening? As I thought about my observations over the next few days, I remembered a line of research into stimulating tasks. I found these journal articles while researching my details book (The Forest and the Trees: Helping Readers Identify Important Details in Texts and Tests, which was so much fun to write but which only 2 people have ever read.) Shortly after I finished the book, the curriculum pendulum shifted to common core, and discussions of reading motivation faded into the background as everyone clamored to talk about text complexity and textual analysis. They have a sobering picture for students who don't get to experience a classroom with opportunities for situational interest: "Likewise, students who have fewer experiences of situational interest in reading will have fewer opportunities for experiencing competence in gaining valued information, fewer occasions for directing their learning, and fewer interactions with peers." So my mistiming of the macroinvertebrate readings turned out to be positive...especially because it led me back to a line of research and thinking that I had half-forgotten. 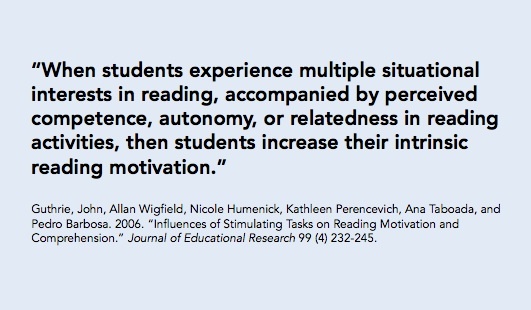 It's helped me to realize that the goal of creating engaged readers is not so elusive after all. When I feel pressure to conform and just assign the worksheets like everyone else, it's journal articles like these that keep me planning the crazy field trips and buying the stacks of books at the used bookstore. I think that many teachers have struggled over the past few years to expand their teaching of "point of view" beyond the traditional first and third person narratives and into identifying an author's perspective. There is a gradient of expository texts, from objective texts in which the author's point of view is faint and difficult to hear, to biased texts dripping with the author's opinions. As I explained to my students, most texts exist in a middle territory in which the generalizations and main ideas of the text do most of the work of conveying the author's point of view. As we started to identify point of view, I found that my students needed the academic language necessary for this task. I designed this resource to give students help as they work on defending their claims about the author's point of view. At this point in the year, many of my sixth graders are writing lengthy text quotes as evidence for their claims. I adapted a chart from the EngageNY materials to help them find the best evidence for their assertions. In the photo you can see the chart we filled out together based on the "Columbian Exposition" text from my Paraphrasing and Summarizing materials over on TpT. This chart worked wonderfully with students, especially the "Word Choice" column. Even students who struggle with identifying the point of view can find the author's words that carry the point of view. 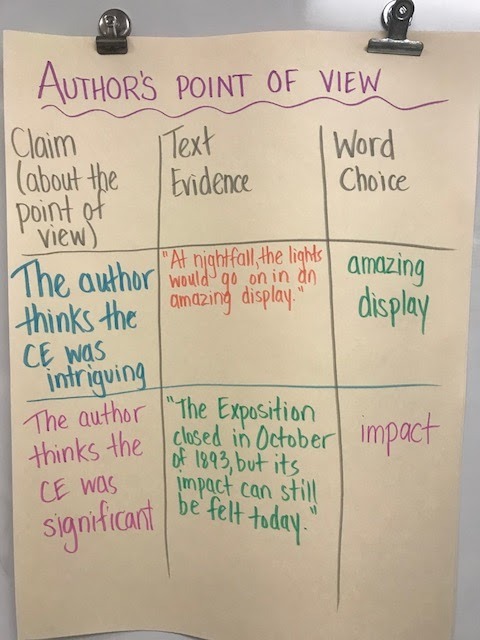 A nice way to mix it up is also to show students text evidence and have them infer the author's point of view conveyed by that text evidence. Helping students to listen for author's point of view in expository text is important! What successes have you had? Oh my goodness, this was my first proper back to school in three years! I moved from fourth grade to sixth grade at the end of 2015, which meant that I had two years with super-easy starts, as I'd taught the students before. So this August I was back to square one with a new crop of readers and writers. True to my reading specialist training I've been using the Qualitative Reading Inventory to listen to my students and gain an insight into their word-solving and comprehension techniques. There are so many things to like about this as a quick reading assessment--the word lists help me to see where kids are with words in isolation, while the passages allow me to listen to students and gain insight into their answers to both explicit and implicit questions. I've been working with one students each day, during independent reading time, and this has worked well. which books they love! What's great about having so many excellent books around the classroom is that I can quickly pull them to explain concepts that I'm teaching. Calamity Jack by Shannon and Dean Hale retains so much appeal for students. This is one book that hasn't seen the shelf (actually, the bin dedicated to Shannon Hale's books) all year. What's neat about this book is that it leads to so many others--not just the Shannon Hale books, but also books by Nathan Hale. Another popular graphic novel has been The Nameless City by Faith Erin Hicks. 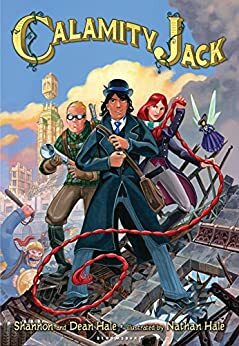 The characters are interesting, the setting is new and exciting, and the action appeals to a wide cross section of readers. Today a student even brought me the sequel, The Stone Heart, to show me the way it reveals a flashback in the text. With a movie on the way, Wonder has been making its rounds through the room. It's so great to have this book at hand to illustrate important concepts about point of view. There are so many reasons to love this book, but Auggie's wry sarcasm is my favorite part. I made these Expository Text Structure signs for my classroom. They're pretty simple, but a nice ongoing reference for my students. I'm starting the year teaching about Earth's Spheres, so I'm using this set of resources that I made last year. They go very nicely with the Crash Course Kids videos on the topic. 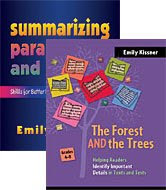 These Summary and Analysis sets are easy to use for ongoing summarizing and text-based essays! I use them on a two-week basis (we're doing the Stormwater text right now) and see so much growth from my students over the course of the year. This spring I've been working a great deal with Google Classroom and the writing process. Each new assignment helps me to consider new questions about writers and how writing skill can be cultivated. Last week I wasn't sure about teaching sonnets with sixth graders, but now I can tell you: sonnets are awesome! Shelley's sonnet doesn't quite follow all of the typical conventions of a sonnet, so I supplemented with "Still will I harvest beauty where it grows" by Edna St. Vincent Millay. After a review of rhyme scheme, we analyzed this poem. I talked it up to kids as an amazing game that poets are playing. Can they find a way to express an idea within these incredible constraints? After they were amazed by the rhyme scheme, I asked students to count the syllables on the lines. "Pick a random line and count," I said. Students started clapping and reciting the poem to themselves. Around the room they started calling out: "Ten!" "10!" "Ten!" All of this structural analysis actually happened before we looked at meaning. And this is a shift from my usual style. I like to go for meaning, meaning, meaning before we look at structure. In a sonnet, though, the meaning is hidden in the structure. Understanding and appreciating the structure first gives students that charge to dig deeply for meaning. When it came time to look for meaning, some students were able to quickly find the theme of "Still will I harvest...", especially because it's stated in the first line. With the help of a stuffed moose as poetry translator, I guided students through the images in the poem. Then we connected the theme of the poem to the images within it. "The ideas go across the lines," one student commented. "One of the things being described starts on one line, and ends on another. Is that because it's a sonnet?" What a great question to consider! Students were able to take what we had learned with "Still will I harvest beauty..." and go back to "Ozymandias." With the help of the visuals from the animation, they could paraphrase the theme. So wow. Later on in the day I overheard two boys talking to each other while they were supposed to be doing quiet writing; I found out they were trying to recite "Ozymandias" to each other. I felt like I won teaching. I'm teaching a sonnet next week, and I'm not sure how I feel about it. Growing up I read my mother's literature anthologies, the thick books of poems and stories for seventh and eighth graders, and I read some of her college textbooks too. These books came from a dank room we called the library, but was really an unfinished room in our basement; what we'd call a bonus room today. Even now when I think of certain poems and stories I remember the damp smell of books that spent many years there. I read my mother's anthologies, but I had the good sense to skip the sonnets. I read some of the narrative poems--I was a sucker for a good story, the more blood and sorrow the better, and I loved encountering Lord Randal again and again in different books. But I really loved the modern poems, stripped of all but the most important words, like the ones by Gwendolyn Brooks or found inside the gift of a watermelon pickle. Perhaps I was a lazy reader. Or perhaps I just had the good sense to skip sonnets. Rhyme I could deal with, but only in the hands of someone like Robert Frost, and a poem written just to meet a set pattern of rhymes seemed an absolute waste of time. Plus sonnets tended to have extra words like O and I really didn't like that. Sonnets, in my opinion, weren't long enough to tell a good story or short enough to really grab my attention and leave me breathless. 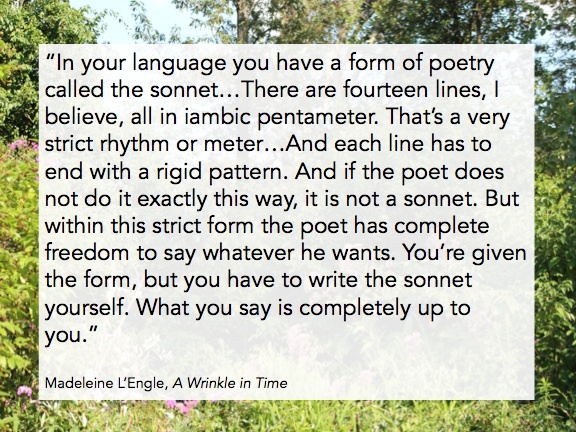 On my second or third reread of A Wrinkle in Time I did notice what Mrs. Whatsit said about sonnets, and it made me reconsider a bit. Maybe sonnets were not such a lost cause after all. So I consented to read a few sonnets, and while I still didn't like the form I could at least like some of the sentiments, especially in "If Thou Must Love Me..." by Elizabeth Barrett Browning. But I still skipped the sonnets in most of the poetry books I read. I think that, besides the form, I also was just too young to appreciate the themes. After all, what 12-year-old is really looking back on lost loves as in "What lips my lips have kissed" by Edna St. Vincent Millay? And this is what gives me such pause as I think about teaching sonnets next week. Sonnets pose both a structural and a thematic challenge to young readers. 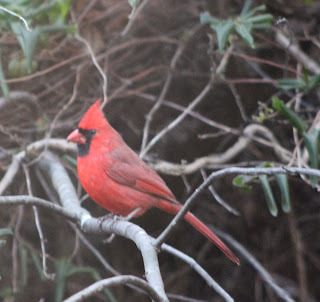 They come from another age, an age when poems followed rules and when every word, carefully chosen, conveys a meaning that may not be initially apparent. Teaching students about reading a sonnet should take time, time to look at what a sonnet is and what it is not, time for students to move through the stages of disliking sonnets and into enjoying them. According to my basal series lesson plan, I have 5 total days to teach lyric poetry, sonnets, personification. Well, four days actually, because the fifth day is supposed to be for assessment. Which brings me back to where I began: I'm teaching a sonnet next week, and I don't know how I feel about it. This year, my students have been writing text-dependent analysis essays every other week as part of the Wonders program. It's been interesting to see how students develop with this form of writing. In my state, there is a huge emphasis on the text-dependent analysis for standardized testing, and one of my challenges this year is to keep the text-dependent analysis from overtaking every other form of writing in my classroom. It's not hard to figure out why students struggle with this kind of writing. Students write what they read. What 12-year-old is going to have much experience with reading text-dependent analysis essays? For that matter, many teachers that I know don't read text-dependent analysis much either. I've gotten really good at reading student summaries and finding incremental progress along the way. For example, I know that every reader goes through the "about" summary phase when summarizing expository text. While the about summary is not on its own a good summary, it seems to be a necessary step for readers and shows real progress over a copy-and-delete summary. Faced with 30 text-dependent analysis essays, I've felt a bit lost. What kinds of responses show progress? What patterns can I find? It's been tough to sift through it all, and I'm still really feeling out my way. However, here are a few patterns that I've noticed. Most of my students are the point where they know that they had better not turn in an essay that is less than 1 or two pages long! (Even though the program only gives kids one page to write their essays, I always give them an extra page to write more.) However, some students are having trouble with reading and understanding the prompt. Students also have entered sixth grade knowing that they need to include quotations from the text in their essays. Now, I've been in the game twenty years, and I must say that even my struggling students compare favorably in this regard to those that I taught 20 years ago. Adding text quotes just wasn't something that was taught at the fifth grade level. 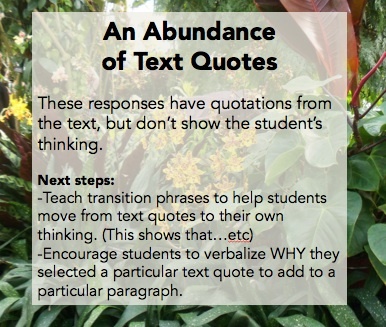 But some responses indicate that my students have over-learned the use of text quotes. They want to let the text quotes speak for themselves instead of explaining why they are needed. I know that teachers in eighth grade will probably groan and say, "I wish these students would stop writing 'This shows that...'!" However, in sixth grade, the use of this transition indicates a step in the right direction. Often, when I ask students, "Why did you put this quote from the text?" they will come out and explain their thinking. I say, "You need to write down that great thinking so that I can read it!" I've noticed that asymmetrical development is actually a promising sign. These responses have one really well-developed body paragraph and one sadly neglected one. Often, once I point this out to students in their feedback they realize that they need to develop both areas of analysis to equal quality. Students need to know that they won't be kept in from recess or punished for spending a long time to complete a strong essay. Spreading the work out over multiple days helps with this too. 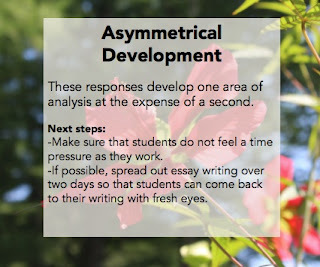 What patterns have you noticed in students' text-dependent analysis essays? Most of the popular teaching techniques for teaching of writing are predicated on delightful optimism and rose-colored glasses. Don't worry about teaching to the test! Help every child discover the writer within! Everyone can be a great writer! If you just work on finding the joy in writing, every child will spontaneously write meaningful essays with sophisticated transitions! Being the deeply pessimistic person that I am, I can't believe these truisms. I have trouble getting to the end of an article about the teaching of writing without becoming consumed by guilt and worry, toxic feelings that I'm not covering enough, that I'm not keeping on pace with grammar, and that my students will do horribly on the next round of standardized testing. BUT I do have an optimistic inner voice, buried very deep and speaking very quietly. If I stand still enough and listen carefully enough, this optimistic voice tells me that there are some parts of my writing classroom that work, even for someone as deeply flawed as me, and that may be of use to other writing teachers. I'm going to write them down very quickly before I convince myself otherwise. While students are writing, I like to walk around the room with a clipboard. I write down different kinds of notes. Sometimes, I'm doing a progress check to see where students are in the writing process. On other days, I'm looking for patterns of student weaknesses or errors. I should probably put these notes in an organized form, or keep them in color-coded binders. Usually they just accumulate on my clipboard for me to peruse and consider as we move on in the writing project. Sometimes I forget about them until months later and find them and feel badly about myself. But my voice of optimism says that maybe the important part is not what I do with the notes, but that I take them at all. Taking the notes means that I am noticing what is going with the writers in my room. They are important in the moment, and I use each day's notes to plan for the next day's instruction. In the traditional model of teaching writing, forms of writing steadily come down a conveyor belt of curriculum. The dutiful teacher looks to see what is next on the conveyor belt and teaches it. In slow writing, I still have to look at the conveyor belt to see which forms must be taught. However, I structure the class to work on several forms at the same time. Right now, for example, my students are doing background research for an explanatory essay about biomes. This essay won't be written until January, but students started researching biomes after Thanksgiving. The idea is that good writing can only happen with a wealth of knowledge and expertise, and that students need time to research and think about a topic before they produce. This is a slow method of writing, but it can help students to understand what it is to be a writer. As students were researching biomes they were also writing a narrative and doing some summarizing. Writers like to have several projects at a time to work on, because then they can procrastinate productively! I've worked with editors who have absolutely insisted that I make certain changes to my writing. As a teacher I do the same. There is a place for insistence, even nagging, in the writing classroom. For example, in our work with narratives, I had a student who didn't add any dialogue. This wasn't a stylistic choice, but a stubborn one. This student wanted to be done with the assignment and didn't want to add dialogue. I'm sorry, but no. I insisted. I made him un-submit his piece of writing to add dialogue. Reflective teachers of writing are sometimes hesitant to insist that students add or change things in their writing. "It's their writing--I don't want to interfere too much," is something that I probably said fifteen years ago. But nope. I need to find the right way to interfere. I don't want to be a hated editor, but I need to be a meddling teacher. Any writing teacher will attest to the value of this! Sometimes during writing sessions I need to get out of the way to let kids write. However, students often want to talk with me or ask for help. I don't like to tell kids that I won't help them, so I get out work to do and sit at a student desk. For some reason, the fact that I look busy encourages students to go back into themselves and use their inner resources to solve a problem that they may have asked me about. You have to be cautious with this one, though. Look too busy and you'll find that there's a student on the other side of the room who has gone fifteen minutes without writing a word. I like to punctuate periods of "looking busy" with clipboard cruises to keep students guessing. Can anyone tell us about a writing problem that they solved today? Does anyone have a writing problem that they couldn't solve today? These questions never fail to lead to interesting discussions. As I hear students talk about how they solved writing problems, I can start to feel--maybe-- a bit less pessimistic. I like to look at "homework" as an ongoing set of reading activities that students can do either in or out of school. Some students like to do reading activities at home on their own or with adults. This is great! For students who don't have that home support, I like to build in flexibility within the school day for students to do the activities in the classroom. It's not hard to manage this approach and makes everything about my teaching life so much easier. When I taught fourth grade, I spent years devising meaningful homework assignments with vocabulary, fluency practice, and writing. (You can find the January set here.) I loved these packets because they were fun and interesting for kids and adults. The move to sixth grade forced me to think of a new homework routine. What kinds of activities did sixth graders need for ongoing practice and response? I devised the Summary and Analysis packets to answer this question. Each packet contains an article, a summarizing prompt with a rubric, an analysis response question, also with a rubric, and a comprehension quiz. I started with the texts. The teacher side of me said, "I need high-quality, well-researched texts related to our science topics, please!" The writer side of me harrumphed, procrastinated, and finally came through. I assign texts on an alternating week schedule, with assignments due every other Thursday. This gives students plenty of time to work on the assignment both in and out of class. To add to the enjoyment and understanding of the texts, I often show a video or two about the topic--here is my playlist: Article Response Playlist. Through the months I've tweaked the routine a bit. At first I thought that students would read the texts and generate responses and questions on their own. They found this very challenging, however, which led me to adding some questions to the assignment cover sheets. I've found it interesting how much students resist repeated readings, even with the support that I provide in the classroom. The repeated readings are so important for fluency and for comprehension! I still have trouble convincing students of this, however. One scaffolding tool that I didn't get to write about in my book is the simple topic/details frame. I've added some of these to the Summary and Analysis packets to help students see how the texts are developed. Very simply, these graphic organizers show the headings in the text and provide space for students to write key ideas. They work well for students and can be provided with varying levels of support. 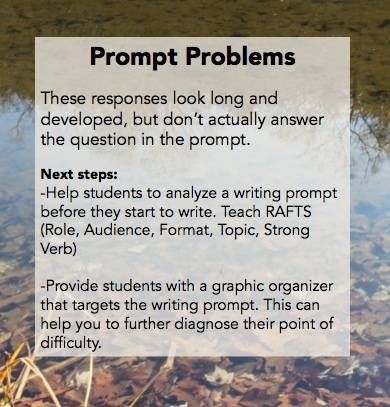 After students summarize, they respond to a prompt. Most of these are analysis prompts. Some lead to an essay, while others can be answered completely in just a paragraph or two. These analysis prompts are very challenging for sixth graders, many of whom still confuse content with structure. Most of the analysis questions ask students to think about how a piece is written, and sometimes students try to answer by writing about content or rewording their summaries. This shows me that analysis is a skill that needs continued practice and feedback! A summary and analysis routine is easy to implement with any texts! If you are interested in checking out what I have written, you can find a bundle here.